Is it fall? Is it winter? Will it snow or will the yellow and orange leaves hit the deck first? 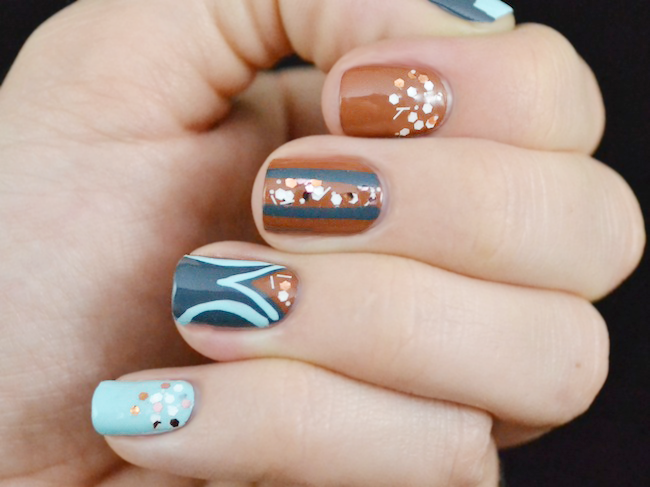 This copper conundrum happening all over Colorado can be captured in one polish from Born Pretty Store. The polish I'm talking about is a lovely mix of copper and matte white hexagonal glitter, and some feather white stick-like glitter. Just like the leaves and snow! And here's what it looks like in the bottle. This was a good glitter, easy to apply. It also had pretty even coverage, surprising enough. Glitters are difficult to lay evenly, but this one was fine. At least in the amounts I used it for. The other colors used in the nail art were A-Piers to Be Tan (OPI), Decoded (ORLY) and Mermaid (Tammy Taylor). Seems tribal, which was what I originally thought the polish was called. You can pick up this polish (called #5 in this link here) for under $4.00, and don't forget the 10% unlimited coupon code, C10X31. This product was sent to me by Born Pretty Store. The review is based entirely on my experience with the product and was in no way influenced by anyone.